A&D EJ-120 Newton Balance 120 x .01gA&D Weighing is pleased to announce the introduction of the EJ Newton Series Precision Compact Balances. The Newton line stands out from the crowd with an eye-catching design and color scheme as well as the performance users have come to expect from A&D, all at a very affordable price. A&D EJ-6100 Newton Balance 6100 x .1gA&D Weighing EJ-6100 Newton Series Precision Compact Balances with 6100 gram capacity and tenth of a gram readability stand out from the crowd with an eye-catching design and color scheme as well as the performance users have come to expect from A&D, all at a very affordable price. 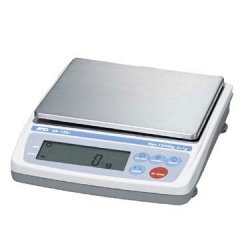 A&D EK-1200i NTEP Balance 1200 x 0.1gThe A&D EK-1200i EVEREST SERIES compact balances have been designed with enhanced electronics, wider selection of capacities & resolutions, and all feature RS-232C as standard. 1200 x 0.1g NTEP approved class II. 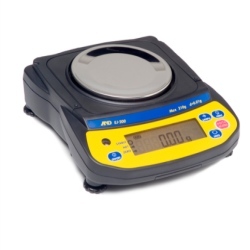 A&D EK-6000i Portable NTEP Balances 6000 x 1gThe A&D EK-6000i EVEREST SERIES compact balances have been designed with enhanced electronics, wider selection of capacities & resolutions, and all feature RS-232C as standard. 6000 x 1g NTEP Class III approved. A&D EK-600i NTEP Legal Balance 600 x 0.1gThe A&D EK-600i EVEREST SERIES compact balances have been designed with enhanced electronics, wider selection of capacities & resolutions, and remote-zeroing. Buying gold from customers, this might be the scale you need. All feature RS-232C as standard. 600 x 0.1g NTEP Class III approved. A&D EKW-09i NiMH Battery PackItem NiMH Battery pack for A&D EK-600i and EK-1200i digital balances. A&D EW-12Ki Triple Range NTEP Balance 12kgThe A&D EW-12Ki Triple Range balances have been designed with enhanced electronics. Capacity is 3000 / 6000 / 12,000 g x 1 / 2 / 5 grams. NTEP Class III legal for trade. 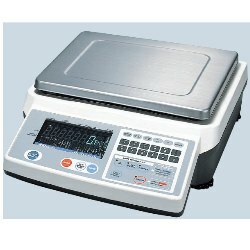 Platter is 5.2" x 6.7"
A&D EW-1500i Triple Range NTEP Balance 1500gTriple range balance from A&D Weighing. The EW-1500i is NTEP legal for trade class III. Capacity is 300 / 600 / 1500 g x 0.1 / 0.2 / 0.5 grams. Platter is 5.2" x 6.7"
A&D EWi EKi EJ Newton Series Carry CaseCarry case for A&D EKi, EWi, and EJ Series Newton series balances. A&D FC-02i Rechargeable Battery PackItem FC-02i Rechargeable Battery pack for A&D FCi Counting scale. A&D FC-1000i Hi Resolution Count ScaleOne of the most powerful and useful features of FC-1000i Counting Scale with 2 pound max capacity is ACAI, Automatic Counting Accuracy Improvement. It is not a new feature but a feature AND Weighing had incorporated to the first generation of FC counting scales in order to maximize the accuracy of counting without sacrificing ease of use. Great Counting Scale! Standard AC power. Battery available as an option. Remote scale connector is available as an option. A&D FC-10Ki Hi Resolution Count ScaleThe A&D FC-10Ki digital parts counting scale features ACAI, Automatic Counting Accuracy Improvement. It is not a new feature but a feature AND Weighing had incorporated to the first generation of FC counting scales in order to maximize the accuracy of counting without sacrificing ease of use. Great Counting Scale! Standard AC power. Battery available as an option. Remote scale connector is available as an option. Capacity: 20 lbs.